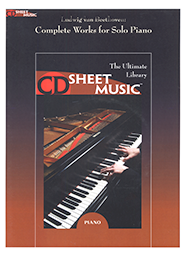 This CD contains virtually all the solo piano works of Debussy and Faure. Here are Debussy's Arabesques, Clair de Lune, Images, Children's Corner, Preludes, Etudes, all piano 4-Hand and 2-Hand works. Also included are Faure's Nocturnes, Barcarolles, Impromptus, Dolly (2 versions) and Preludes - over 1200 pages.